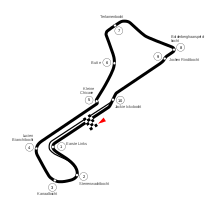 The 1973 Belgian Grand Prix was a Formula One motor race held at Zolder on 20 May 1973. It was race 5 of 15 in both the 1973 World Championship of Drivers and the 1973 International Cup for Formula One Manufacturers. The race was won by British driver Jackie Stewart driving a Tyrrell 006. The entire Zolder track had to be resurfaced a week before the actual Grand Prix after a few drivers such as Jackie Stewart, Emerson Fittipaldi and François Cevert walked around the track to inspect it. They found that the track started to break up as a result of a previous race, and the track owners immediately decided to resurface the track, only a week before the Grand Prix. Cevert, Fittipaldi and Stewart refused to drive on the track because of the danger, and Cevert responded to the FIA that they would attempt to cancel the race if the owners did not do a good enough job of fixing the track. Future world champion Niki Lauda took his first ever career points here, by finishing in fifth place in his BRM. This race saw the end of teams' numbers changing from race to race - the numbers teams raced with at Zolder lasted until the end of the season. For 1974, the finishing positions in the Constructors' Championship were used to allocated the numbers, after which teams did not change numbers unless they won the Drivers' Championship (or signed the current World Champion). ^ "1973 Belgian Grand Prix". formula1.com. Archived from the original on 3 September 2014. Retrieved 22 December 2015. ^ a b "Belgium 1973 - Championship • STATS F1". www.statsf1.com. Retrieved 12 March 2019. This page was last edited on 12 March 2019, at 14:27 (UTC).